What is the quality of Hidden Crown® hair? Hidden Crown Hair Extensions® has 140 grams of the finest quality human REMY hair to add instant length and volume. This is the same amount of hair that you’d purchase in a full set of clip or bonded extensions. REMY hair is the highest grade of human hair on the market. This is because the hair still has its outer cuticle layer and all the follicles face the same direction. This makes your Hidden Crown last longer, stay shinier, feel silky, and stay tangle free. Hidden Crown® is also a double-drawn hair extension. This means that the strands are the same thickness from root to tip rather than becoming wispy at the ends. This process is very laborious, resulting in a bit higher price, but the very best quality. 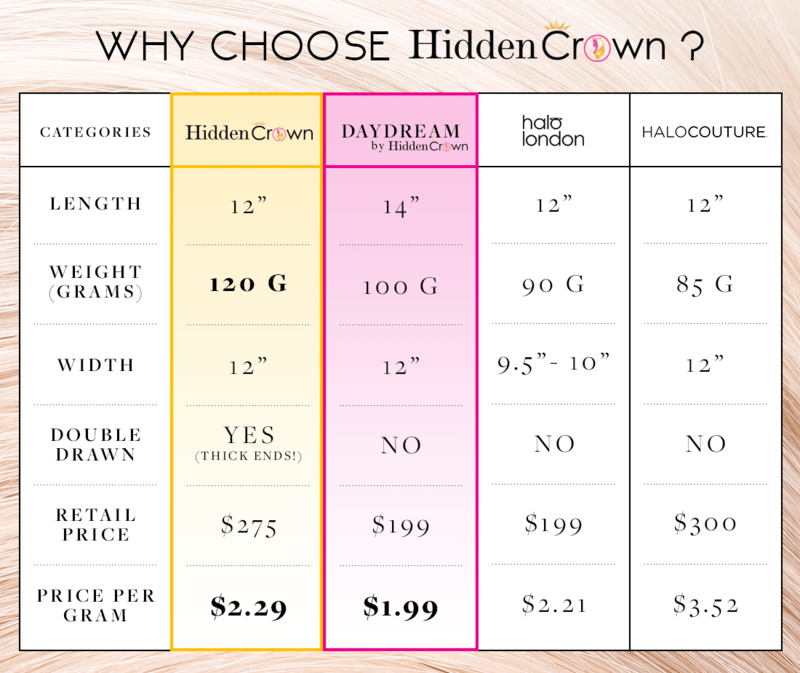 What is the difference between Daydream and Hidden Crown®? Our signature Hidden Crown® simply has more hair and Thick Ends (double drawn). Daydream hair is about 35% less hair and has natural ends, like your own natural hair. Natural ends are the most common type of hair used in most extension brands. Very few companies sell double drawn hair because it is a much more expensive and rare hair. They are both made with the highest quality REMY hair. REMY hair is not a brand, but a grading system for hair extensions. It’s considered the finest quality because, unlike non-remy hair extensions, the cuticles are kept intact and not stripped. Preserving the hairs’ cuticles and aligning them creates extensions that are completely natural in appearance, keeps them soft, and they’re less likely to tangle. How does the Hidden Crown® stay in place? Hidden Crown® has an invisible wire that simply sits on your head and is undetectable. It takes less than a minute to put on and literally only one second to remove. It’s the perfect extension for anyone with thin or damaged hair because it is free of glue, clips, tape, and other problem causing attachments. Instead of attaching directly to your hair, the Hidden Crown® uses the weight of your own hair that’s pulled over the wire to securely hold the extension in place. You can wear them throughout the day without having to worry that they’re going to fall out. We do not recommend working out, sleeping or swimming in your extensions as they are likely to get damaged and tangled while doing so. You can find your color by using our color chart. If you order the wrong color, DON’T WORRY! Just send it back to us unopened and we will get the right color to you. If you are between shades, we recommend going with the lighter color option because many people have differing shades of color throughout their hair. It is also much better for you to darken the crown rather than lighten it. Lightening your extension is not recommended. It is best to color match from the back-mid section of your hair down to the ends since that is where your crown will sit when you wear it so try not to match it with the roots. If you need help finding your perfect color, feel free to send us a recent photo from the back, taken outside in natural light with no filter. Email contact@hiddencrown.com and our color experts can match you! How long will my Hidden Crown® last? The lifespan of your Hidden Crown® will depend on how often you wear it and how well you take care of it. Our estimate is anywhere from 3-4 months up to a year or more. For the longest life, you want to avoid excessive heat, excessive brushing, and excessive washing. 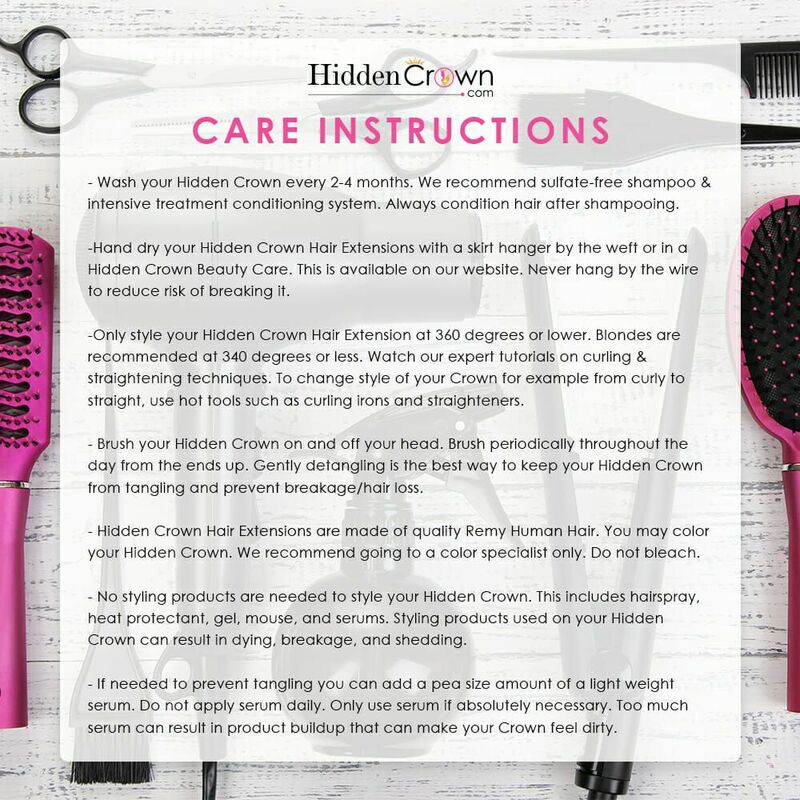 Do not use any heat protectant or styling products on the Hidden Crown Hair Extension®. Styling products have chemicals in them that are not meant for dead, processed hair extensions. Because of this, it is likely that these products will cause drying, damage, matting, and severe tangling. Anything you put in your own hair besides hairspray can rub off onto the extension so be mindful. How often should I wash my Hidden Hair? Try to wash your Hidden Crown® only when it’s 100% necessary. You should aim to wash every 2-4 months or when you feel there is a lot of product buildup making it difficult to style. Since the hair is not attached to your scalp, it will not receive natural oils so you don’t need to wash it as often as you would your own hair. Stay away from shampoos/conditioners with sulphate and use hydrating conditioners if possible. We recommend that your should not choose a length more than twice the length of your normal hair. Can I color my Hidden Crown®? Though we have many colors, many customers deposit color to the extensions in order to achieve their perfect color match. Generally going 2 shades darker is not a problem, but we recommend always doing a test strand first as the extensions will absorb color faster than normal hair. We advise against lightening Hidden Crown Hair Extensions® in any way, because the extension has already been color processed. Just as bleaching agents may cause damage to your own natural hair, it can severely damage the extensions. It’s best to seek professional assistance as we cannot guarantee results or be held responsible for any failed color attempts. You can find many YouTube tutorials on how to color human REMY hair extensions, but doing so will VOID any responsibility on Hidden Crown’s® behalf regarding the extension hair. If you ordered the wrong color, don’t worry. You may exchange your Hidden Crown® for a different color. Simply contact us for instructions and return the unused extension in it’s original packaging within 7 business days and we will send a new Hidden Crown® to you. You are responsible for exchange shipping costs. Your Hidden Crown Hair® will ship out the next business day after payment is received. We ship from Utah, USA. USA: FedEx Standard Overnight shipping takes 1-2 days depending on location. We have selected highly professional and reliable shipping partners to work with. We strive to provide excellent and responsive customer service and we ship to valid postal addresses only and provide tracking scan confirming delivery. If customers have signed a standing shipping release for a delivery to be left at the door or in their mailbox then we cannot be responsible for lost or stolen shipments. In the event a customer’s tracking number states delivery was made to the customers address, Hidden Crown Hair® does not offer refunds if the item is claimed to not have been delivered. Orders received before 3:00 p.m. Mountain Time will ship the same business day, unless there is an unavoidable delay. Orders received after 3:00 p.m. Mountain Time will be shipped the following business day. Please note that business days refer to Monday - Friday and exclude holidays and weekends. FedEx is not available tp ship for PO boxes. All orders over $500 require signature confirmation. Note: Our business hours are Monday - Friday. Hidden Crown Hair Extensions will do everything in our power to ensure prompt delivery on all orders. However, due to acts of nature and other issues, there are times when our chosen carriers are not able to perform the service requested. Hidden Crown cannot issue refunds for shipping charges for delayed packages. Do you have a Return Policy or an Exchange Policy? Can I purchase a Hidden Crown Gift Card? Of course. Please click here to purchase gift cards. If your question is not answered here, we also recommend checking out our YouTube channel. You can also email us any questions you have at contact@hiddencrown.com! We respond to every email Monday-Friday within 24 hours.